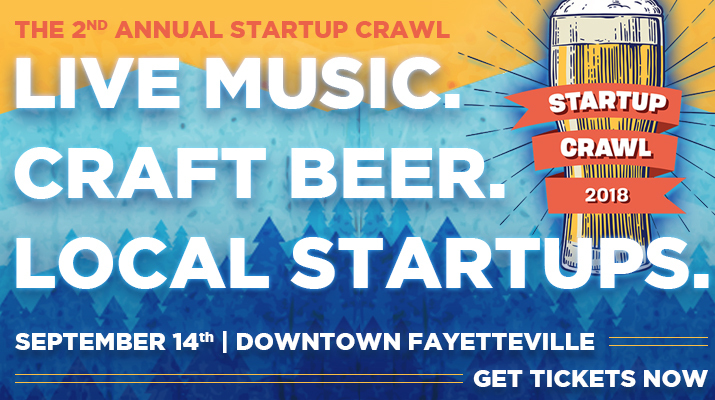 The event is just like a Pub Crawl, except the stops are startup companies paired with all of your favorite local brews – Beer, Cider, and even Kombucha! It is free to attend, but for $15 you’ll receive full access with your bottomless beer cup, which is both a souvenir and the only way to access the beer. The Crawl kicks off at the Arkansas Research & Technology Park from 4-6 PM with an electric car rally and an opportunity to meet the most high-tech companies in the state, working on everything from solar panels to semiconductors for NASA. Then regular check-in begins at 5pm on the Fayetteville Square which will house a Mega-Location where you can meet all of the companies who aren’t within walking distance. A bus shuttle will be running between the stops until they close at 10pm. Stops will be on Dickson Street, at the Mill District on MLK, and around the Fayetteville Square. The bands performing are all local favorites: Arkansauce, Dana Louise, and The Fast! This is the second year annual Startup Crawl, hosted by Startup Junkie and the 2018 presenting sponsor is Tyson Foods. For tickets, visit Eventbrite.com. Paid Advertisement – This post paid for by Startup Junkie. If you’d like to advertise your new business or grand opening in a future promotion similar to this, call Dustin at 479-387-1002 or send us a message.